Spring is prime time for seeding the summer garden. Whether you're looking to grow flowers, herbs, veggies or foliage plants, there are certain varieties that are easier to grow from seed than others - and particular seed companies that are more reliable sources for your seeds. There is nothing easier than scattering seeds and letting nature do the work of transforming them into beautiful plants. While growing a garden is rarely that easy, the warm temperatures and ample rains of spring are an ideal time to germinate seeds, leading to a spectacular garden by summer. Some plants are much easier to grow by seed than others, so use the recommended ones to take advantage of the spring planting period. These are among the most summery flowers that grow almost effortlessly from seed. 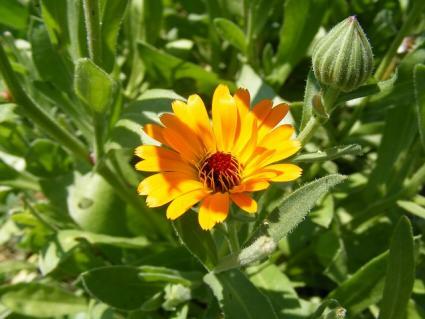 With bright orange, pinwheel-shaped flowers, nothing is more cheery than calendula. 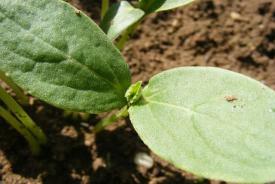 Scatter the seed in any area of the garden with moderately loose and fertile soil and they will do the rest. The flower petals are edible and are often used to garnish salads. Annual summer salvias come in a range of colors, but the lipstick red variety is the most popular. They thrive in hot weather and have minimal requirements in terms of soil quality or frequency of irrigation, making them very easy to grow. 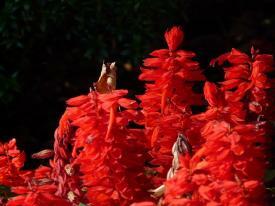 They germinate readily from seed and are one of the best plants for attracting hummingbirds. These also have sunny, pinwheel-shaped flowers but are typically grown as a mix of different colors, resembling a Mexican pinata. Like the others, the cosmos seed can simply be cast in any sunny area with loose soil and nature will take it from there. Many summer vegetables and herbs are temperamental and require diligence to start from seed and grow to fruition, but here are some notable exceptions. 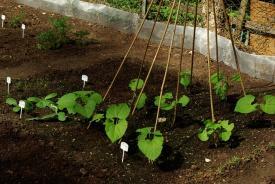 All types of beans - bush beans, pole beans, butter beans, soy beans, and their many relatives - sprout in a week or less after they are pushed into a bed of loose soil. They then grow at a dramatic rate, rarely with any trouble from pests or disease, to produce copious quantities from a single plant, often for the entire summer season. 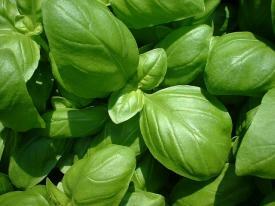 There is no easier herb to grow in summer - or more associated with summer - than basil. Plant the seeds about two inches apart in a garden bed after all danger of frost has passed and plan to make your first batch of pesto about two months later. Gardeners like to joke that they can never eat all the cucumbers they grow. They produce for a short period in mid-summer, but during that burst even a single plant can produce enough to exhaust all the cucumber recipes in the cook book. The seeds germinate easily, the vines grow quickly and when the cucumbers ripen, you know you're in the depth of summer. A summer garden of flowers, herbs and veggies can be balanced out with a few interesting foliage plants. These are arguably the three easiest of those to grow from seed. This plant is known for its wildly colorful foliage and shade tolerance. 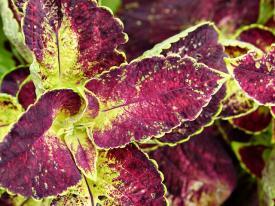 Sow the seeds in a bed of rich soil in late spring and a few weeks later, the coleus should begin to show its patterned leaves that come in shades of red, chartreuse and purple. This is one of the fastest growing summer plants. The large, unusual-looking seeds should be planted one to two inches deep, but rarely need any coaxing to emerge from the ground and grow. 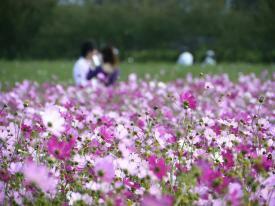 The plants can reach eight feet by the end of summer and resemble a small tropical tree with dark-colored leaves. The seed pods are also highly decorative and can be used in dried or fresh floral displays. 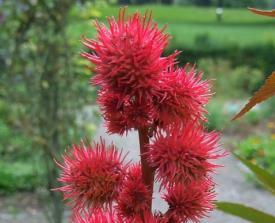 Castor bean plants are the source of castor oil - however, all parts of the plant are extremely toxic if ingested. 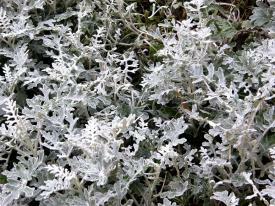 For a silvery white summer foliage plant, try dusty miller. Sow the seed as soon as the soil warms up in spring and by mid summer you will have an undulating carpet of fuzzy leaves to surround the taller flowers. Now that you have an idea bout the best seeds to look for, shop at some of the top-rated seed companies that sell them. Johnny's Selected Seeds, a 40-year old employee-owned company in Maine, is noted as one of the best seed companies by Mother Nature News. In a survey of hundreds of seasoned gardeners, Johnny's was ranked first in numerous categories, which included not only the quality of their seed, but their commitment to sustainability. Johnny's specializes in vegetable seed, but sells numerous flower seeds too. Thompson & Morgan is one of the largest and oldest seed companies in the world and is constantly winning awards for their plants. TV personality and horticulturalist Alys Fowler includes their catalog in her list of favorite seed sources for Gardener's Illustrated magazine, citing their reputation for reliable seeds and comprehensive growing instructions. "If it says it has guaranteed germination, then it has," says Fowler of their catalog in the article. Park Seed, included on The Old Farmer's Almanac's "list of editors' and readers' favorites", is an established company offering a dizzying selection of seeds. They have compiled a list of their award winning varieties, which includes beans and cucumbers, that have been chosen as All-America Selections. If you're considering purchasing from a seed company and want to get a better sense of their reputation, Dave's Garden has a directory of nearly 8,000 mail order garden companies called the Garden Watchdog where you can search for them. Customer reviews are listed for each one and with over 40,000 customers weighing in, this is considered one of the most established, authoritative websites for the purpose. Spring is full of summer fantasies when it comes to the garden. By choosing the easiest plants and seeds from the best sources, you'll end up enjoying your summer garden much more, and toiling in it much less.